Step One is crossing the pirates-infested Arabian sea on a boat from Djibouti. Step Two is sweating for days in the war-ravaged port of Aden in search of a travel permit, which includes endless khat chewing sessions with local officials in ruined hotel rooms and getting used to militiamen, nightly rounds of bullets, power blackouts, poor food, beggars, displaced people and piles of garbage. Step Three is negotiate a car and a driver willing to take you to the red zone through dozens of check-points. Then you finally get to the enclaved city of Taiz, that just four years ago was named as the official cultural capital of Yemen. I am the first Western journalist venturing inside the besieged town and what I found is appalling: since 2015, the shia Houthi rebels who conquered Sanaa and most of North and West Yemen are waging a brutal house to house war against the local sunni militias, shelling the civilian population of about 400,000 with Katyusha rockets, howitzers, mortars and anti-aircraft missiles from their positions on the hills around the city. The Saudi-led multinational coalition which has bombed swathes of the country, driving the rebels out of much of the South, has been unable to break the siege. And the pro-goverment fighters who control the heart of Taiz are by no means less vicious: they’ve been accused to have tortured and summarily killed their enemies. It’s a humanitarian disaster. People are unable to attend to their most basic needs. Drinking water is barely available. Food is scarce. Severe malnutrition is on the rise. There is no electric light and fuel for the generators is sold on the black market in plastic bottles. Tons of garbage are rotting and burning in the streets, filling the air of toxic fumes. Crowds of beggars roam the sidewalks. Hundreds of houses, schools, mosques, hospitals have been shelled and turned into rubble. Aid trickles in by chance and even the International Red Cross was forced to relocate its staff out of the city due to the intensity of the fight. Few hospitals are still functioning and the few unpaid doctors and nurses are struggling with a cronic lack of equipment and emergency drugs. 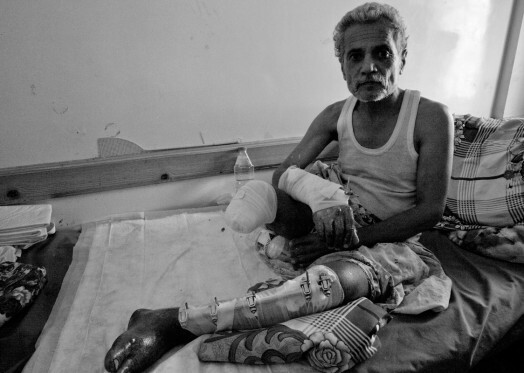 Patients admitted in ER with serious shrapnel wounds, brain injuries or traumatic limbs’ mutilations by landmines have little chance to survive. The inner city frontline runs through the burned to the ground buildings in the Hay Bank district. Snipers shoot anything that moves. Mainly after sunset, when fighters get high chewing khat. Bullets come from nowhere, with no warning. Bringing terror to the streets of Yemen’s Sarajevo.